A research service is advising soybean growers to scout fields for a damaging pest immediately. The On-Farm Network® encourages soybean farmers to scout fields for soybean gall midge. On-Farm Network® director Scott Nelson says the insect, a relative of the hessian fly, can severely damage yield potential. Iowa State University (ISU) Extension and Outreach entomologists have identified and confirmed the pest in 12 Iowa counties. Nelson says the pest is spreading and covering a larger acreage than previously witnessed in the state. An obvious sign of soybean gall midge is brown and/or dead plants. Galls, which are the result of feeding larvae, appear on the lower stems. Orange or white larvae may be found feeding on the vascular tissue, upon peeling back the stem. Nelson says the first way to control the insect is to understand its extent. 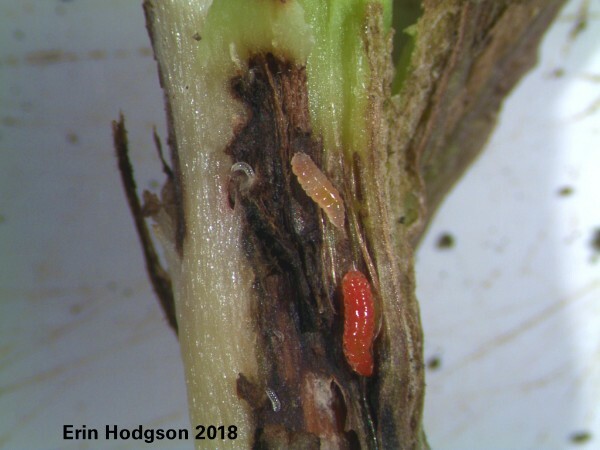 The On-Farm Network® is asking growers who have spotted soybean gall midge in their fields to email research@iasoybeans.com.